The July 2017 Radiologic Technologist (Radtech) and X-Ray Technologist board exam results were released online in three (3) working days after the last day of exam. The complete list of passers, top 10 (topnotchers), top performing schools and performance of schools are available on this page as announced online today, August 3, 2017. UPDATE: 1,945 out of 4,195 passed the Radiologic Technologist Licensure Examination and 61 out of 248 passed the X-Ray Technologist Licensure Examination. The Professional Regulation Commisssion (PRC) administered the Radtech and X-Ray Tech board exam on Sunday and Monday, July 30 and 31 in the cities of Manila, Baguio, Cagayan de Oro, Cebu, Davao, Iloilo, Legaspi and Tuguegarao. The examination for Radiologic Technologists (Rad Tech) has these covered areas : radiologic physics, equipment and maintenance, radiobiology, radiation protection and quality assurance, image production and evaluation, radiographic procedures and techniques, and patient care, management, ethics and jurisprudence, human anatomy and physiology and medical terminology and radiological sciences. X-Ray Technologist exam, on the other hand, covers the same subjects above excluding radiological sciences. Based on PRC Resolution No. 2016-1019, the target release date of Radtech and X-ray technologists is on Thursday, August 3 or in 3 working days after the exam. In the same period last year, results were out online in seven (7) working days. 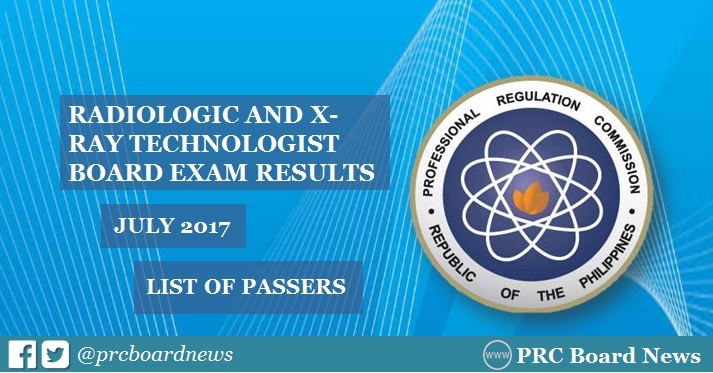 A total of 1,639 out of 3,833 passed the Radiologic Technologist Licensure Examination and 56 out of 213 passed the X-Ray Technologist Licensure Examination. Note that the results of examination with respect to two (2) examinees were invalidated as per Board Resolution No. 04 Series of 2016. In July 2015 exam, results were announced online in 3 working days. PRC announced that 1,325 out of 3,043 passed the Radtech board exam and 53 out of 210 passed the X-Ray exams. PRC hailed Saint Louis University (SLU) and Davao Doctors College, Inc. as the top performing schools for July 2015 and 2016 Radiologic Technologist Licensure Examination as per Commission Resolution No. 2010-547 series of 2010. Which school do you think will top the recent board examination? PRC Board News will update this page for the full list of passers, topnotchers and performance of schools once announced.